While restaurants can be rather noisy, especially in a city like ours where we love to eat, we have our share of haunted restaurants with more than food on the menu. You can dine with the departed in some of our best establishments and toast to those who can toast no more. I love each of these locations for their fine meals and service alone, but the real treat is the extra added spirits that compliment the gastronomic experience. 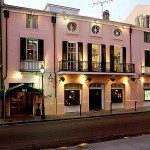 Brennan’s – Easily recognized as one of New Orleans most famous restaurants for its fine dining, it is also fast becoming well known as remarkably haunted. 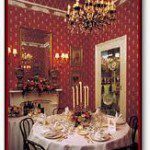 Having had the pleasure of being involved in a paranormal investigation here, we dined in the infamous Red Room that is haunted by a man who hung himself. I also identified the banging of the pots and pans as the sounds made by a former chef so dedicated to his craft that he was buried with his carving knife and fork. The wine cellar is another point of interest as many strange occurrences have happened back there and many strange sounds fill the air. 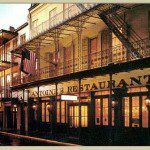 Antoine’s – Opened in 1840, Antoine’s is the country’s oldest family-run restaurant still in existence. Generations of owners and patrons have filled this fine dining establishment with all of the history necessary for a haunting. Not easily deterred from keeping an eye on the business, founder Antoine Alciatore is said to visit nightly along with other family members whose after-life dedication continues to serve signature dishes nightly. Arnaud’s - Arnaud Cazenave opened his establishment here over 80 years ago. A colorful character, he was dubbed “Count Arnaud” for his entertaining reign over his restaurant. His spirit is frequently felt flowing through the dining room as he did in life. Arnaud’s also houses a Mardi Gras collection that has amazing residual energy of happy events gone by. Arnaud Cezanave’s daughter is sometimes seen wafting through the Mardi Gras collection complete in ball gown. Muriel’s – I was involved in the first paranormal investigation of this property when it was a restaurant named the Chart House. There had been many strange occurrences reported and I was brought in with a team of paranormal investigators to discover the causes. It quickly became clear that this is one very haunted location. Pierre Antoine Lepardi Jourdan, the original builder and owner had died tragically and continued to roam the floors. There were also slaves and a woman who was somewhat mischievous. I must say that now that Muriel’s has taken over the establishment they have created a very conducive atmosphere for haunting. With a room designed for a séance and a welcome plate of food and glass of wine for weary spirits, Muriel’s is a pretty sure bet for a bit of paranormal adventure. 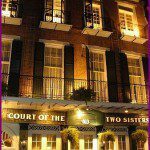 Court Of Two Sisters – World renowned for its jazz brunch, the atmosphere here changes once the sun sets. With a beautiful courtyard, this building once housed the Camor sisters; Emma and Bertha. Dealing in perfumes and gowns from Paris, the sisters were inseparable. They died 2 months apart and are often seen by staff and diners strolling together or sitting in their beloved courtyard. 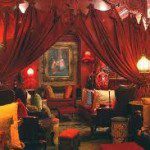 The Bombay Club – With a dark, warm wooden interior the Bombay Club is low lit and filled with spirits. Spirits both literal and figural – they serve over 115 different kinds of martinis. It is also an award winning restaurant is now home to a deceased Madame from nearby Storyville – a former red light district. It seems the Madame is attracted to the sophisticated set and still enjoys the finer things in life. Her figure is often seen sashaying through the dining area and around the romantically situated booths.